During its landmark 50th launch, Europe's Ariane 5 rocket successfully blasted off from the South American coast Friday evening with a commercial broadcasting satellite and a payload to link commanders and troops in the German military. Pushed into the evening sky by two solid rocket boosters and a hydrogen-burning main engine, the 166-foot-tall launch vehicle roared off its French Guiana launch pad at 2201 GMT (6:01 p.m. EDT) Friday. 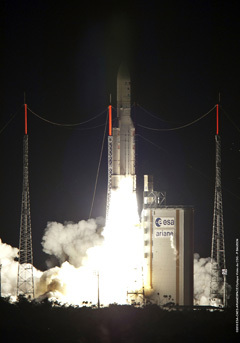 It was the first flight of the market-leading Ariane 5 rocket in more than five months. The launch was delayed two months after last-minute problems with a helium pressure regulator and other glitches compelled Arianespace to order a quality control review of the Ariane 5 program. The month-long review cleared the way for Friday's liftoff after workers replaced the faulty component responsible for a scrub in April. A top-level audit of the program's quality control practices continues, according to Arianespace officials. The new part apparently functioned as advertised Friday, and the Ariane 5 rocket blasted off at the opening of a 43-minute launch window. "This launch has taken place a few weeks behind schedule, but its perfect execution demonstrates that in the face of difficulties, we did exactly what had to be done," said Jean-Yves Le Gall, chairman and CEO of Arianespace. Shedding its solid rocket boosters and payload fairing as they were no longer needed, the Ariane 5 soared to an altitude of 107 miles in nine minutes on the power of its cryogenic main stage. The hydrogen-fueled upper stage ignited and burned for more than 15 minutes to propel the rocket and payloads to nearly 21,000 mph. The rocket deployed the 12,063-pound ASTRA 3B television broadcasting satellite about 27 minutes after liftoff and jettisoned a barrel-shaped Sylda payload adapter a few minutes later. The German Armed Forces' COMSATBw 2 satellite separated from the launcher 33 minutes into the flight, wrapping up the 36th consecutive successful Ariane 5 launch since 2003. "After victory, you deserve it. After defeat, you need it. After [a successful] launch today, we deserve a glass of champagne," said Brigadier General Thomas Franz, chief of the communications division of the Joint Support Command in the German Armed Forces. ASTRA 3B will beam television programming directly to homes and businesses across Europe from Spain to the Black Sea for the next 15 years. Customers in the Middle East and Europe will benefit from two-way broadband Internet communications provided by the satellite under the ASTRA2Connect service. Built by EADS Astrium and operated by SES ASTRA of Luxembourg, the spacecraft will position itself in geosynchronous orbit 22,300 miles above the equator at 23.5 degrees east longitude. At that location, the satellite will appear to hover in a fixed spot over Earth to provide consistent communications. Four apogee motor firings are planned over the next week to raise ASTRA 3B's orbit. "ASTRA 3B is an important satellite for us because it will allow us to grow in the Benelux and the Eastern European markets," said Ferdinand Kayser, president and CEO of SES ASTRA. "It's also an important satellite because it's one of the largest we have ever launched. It will allow us to exploit direct-to-home television and also Internet-via-satellite in Europe and the Middle East, and, therefore, it represents an important growth potential." The satellite will replace two aging satellites, ASTRA 1E and ASTRA 1G, at the coveted position in the geosynchronous arc. The two older satellites, both launched in the 1990s, will be released for other missions, according to SES ASTRA. Another satellite, ASTRA 3A, will remain colocated with ASTRA 3B to continue providing communications coverage. The craft launched Friday carries 60 Ku-band and four Ka-band transponders. SES ASTRA satellites currently located at 23.5 degrees east longitude broadcast more than 400 television and radio channels to nearly 2.9 million homes in Europe, according to Astrium. COMSATBw 2 joins a nearly identical satellite launched in October for the German military. Weighing about 5,500 pounds at launch, COMSATBw 2 was manufactured by Thales Alenia Space under the management of EADS Astrium, the program's prime contractor. The pair of satellites will ensure the German Armed Forces has uninterrupted access to secure telecommunications, including voice and data transmissions, and video and multimedia applications. Germany's new satellite constellation will reach from the Americas to the Far East. COMSATBw 2 will focus its coverage on Europe and Africa. The spacecraft will offer a communications path between the German government, military commanders and troops deployed around the world. 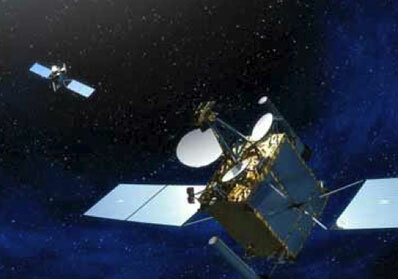 Both satellites carry super-high and ultra-high frequency payloads. COMSATBw 2 will be positioned at 13.2 degrees east longitude, where it will conduct its mission for the next 15 years. "For Germany, this is a major step in extending capabilities, especially for our forces out of the area," Franz said. "Our aim is clear: provide for the best communications system for our troops." Arianespace will be playing catch-up for the rest of 2010 to get off up to seven flights of the Ariane 5 rocket this year. The next mission is scheduled for late June with the Arabsat 5A broadcasting satellite for the Middle East and South Korea's COMS 1 satellite to monitor weather, observe oceans and test communications technologies. More flights will follow at a pace of nearly once per month for the rest of 2010, if Arianespace is able to launch all of its planned missions this year.